Currently, Bitcoin Cash (BCH) is the sixth largest coin, even though the cryptocurrency has experienced a recent community split (the November 2018 Bitcoin Cash hard fork). Due to the network upgrades, the coin features low-cost transactions and a community that’s determined to increase the adoption of the cryptocurrency by constantly developing new solutions as well as partnering with new merchants to accept BCH for payments. This is one of the easiest methods to buy Bitcoin Cash in 2019. If you were carefully checking Bitcoin Cash news, this wouldn’t be new to you. The birth of the coin dates back to August 2017 when a debate between two developer teams resulted in the creation of Bitcoin Cash. The first group – the ones who had stuck with the original Bitcoin (BTC) – argued that they have to implement off-chain solutions to improve the scalability of the network. On the flip side, Bitcoin Cash supporters wanted to upgrade the network by an on-chain method (increasing the block size limit). As the community could not discuss this debate properly, it resulted in the BTC blockchain splitting in two on August 1, 2017: Bitcoin and Bitcoin Cash. In November 2018, a proposed upgrade of the BCH network split the community in two: Bitcoin Cash and Bitcoin SV (Satoshi’s Vision). Although two cryptocurrencies were created from one coin, Bitcoin Cash managed to keep its place in the top 10 digital currencies. Many traders, investors, and crypto enthusiasts made good profits from Bitcoin Cash. In 2017, the coin managed to climb up to over $4,000 from $500 in less than two months. The disagreements within the community did not change the fact that Bitcoin Cash is still a hot asset. Most of the services that allow users to buy Bitcoin also offer BCH trading too. Now, the question stands: where to buy Bitcoin Cash? In this guide, we’ll show you how to buy Bitcoin Cash using brokers and exchanges, comparing the different service providers as well as the payment methods. 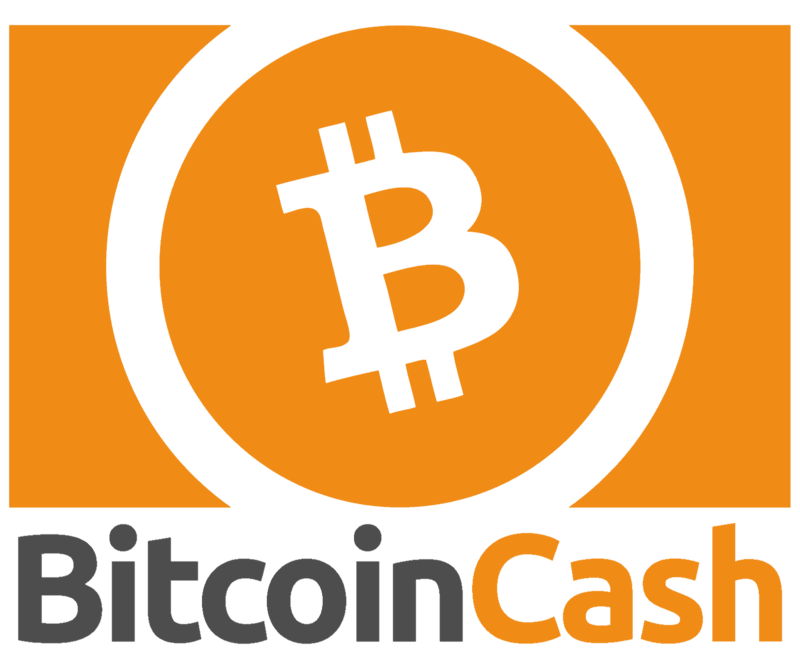 Please note that due to the November 2018 Bitcoin Cash chain split, BCH is sometimes abbreviated as “BCHABC” or named “Bitcoin Cash ABC” on some exchanges and brokers. If you are planning to use a cryptocurrency exchange to buy BCH, you will certainly need a great Bitcoin Cash wallet. The reason for that is that exchanges are highly targeted by attackers and most of them don’t have the required security measures for the safe storage of your coins. But worry no more! You just simply need to create a secure Bitcoin Cash wallet, which we will show you know at two trusted wallet service providers. The first service we are showing you know is the Blockchain.com Wallet. The company, Blockchain.com, has been present in the cryptocurrency space for a while and it is trusted by millions of customers. Over 33 million wallets have been created using the organization’s free service. The Blockchain.com Wallet is web-based, so you don’t have to worry about downloading an app to your desktop or smartphone. Just head to the homepage of the service, click “Sign Up” in the top right corner, fill out the form with the required information. And voilá, your Bitcoin Cash wallet is ready. If you are looking for a smart mobile Bitcoin Cash wallet, look no further. The Infinito Wallet is a multi-coin cryptocurrency storage service that will allow you to send, receive, and hold over 1,000 digital currencies, including Ethereum ERC-20 tokens. To create a Bitcoin Cash wallet via Infinito, head to the homepage of the service and use the links provided in the “Download” section to install the app on your device. You can also check for the app in the App Store or Google Play – Infinito supports both Android and iOS. (Step by Step) How to buy Bitcoin Cash on eToro? 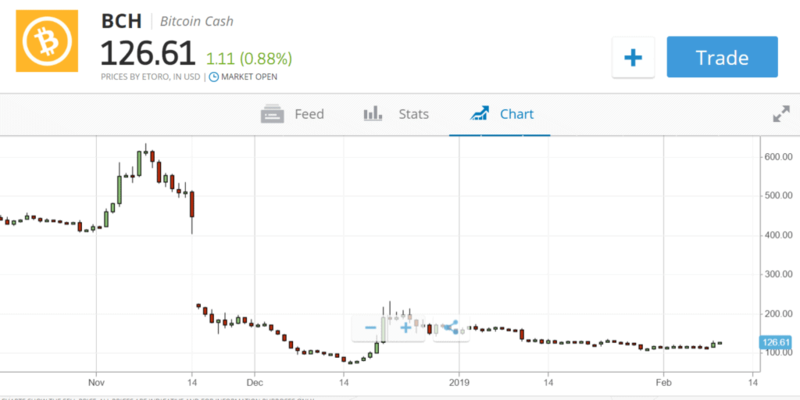 As you will have seen in our eToro review, eToro is one of our top-rated places to buy Bitcoin Cash. 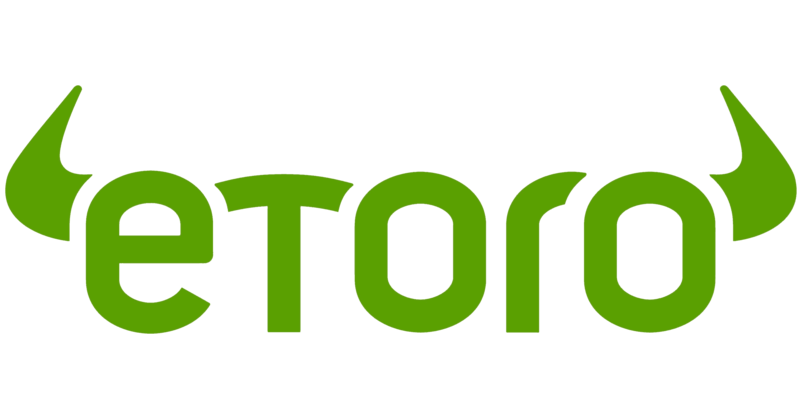 Founded in 2007, eToro is a trusted broker that’s been in business for over 10 years. 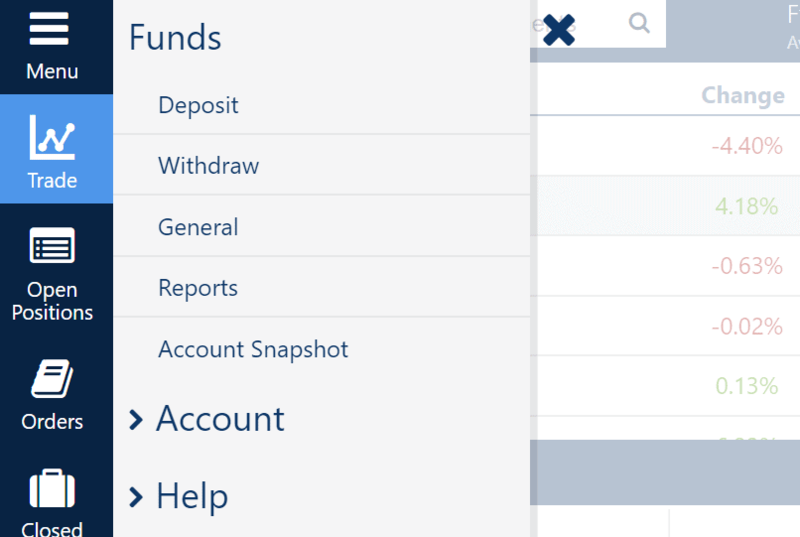 The service features a newbie and user-friendly interface, fast account opening, social trading features, and plenty of payment methods to fund your account. Regulated in multiple countries – including top-tier regulators, such as UK’s FCA -, eToro is considered a safe broker to do business with. What’s different about eToro from other brokers who offer coin trading is the fact that the service is offering outright Bitcoin Cash trading. It means that you own the actual BCH you are trading on the platform. On the other hand, your coins are held in a Bitcoin Cash wallet. The first step to start trading on eToro is to register an account at the broker. Fill in the form with your email address, your desired password, and your phone number. Be sure to choose a strong password that you will remember. You can also use Google+ and Facebook to register an account faster on eToro. 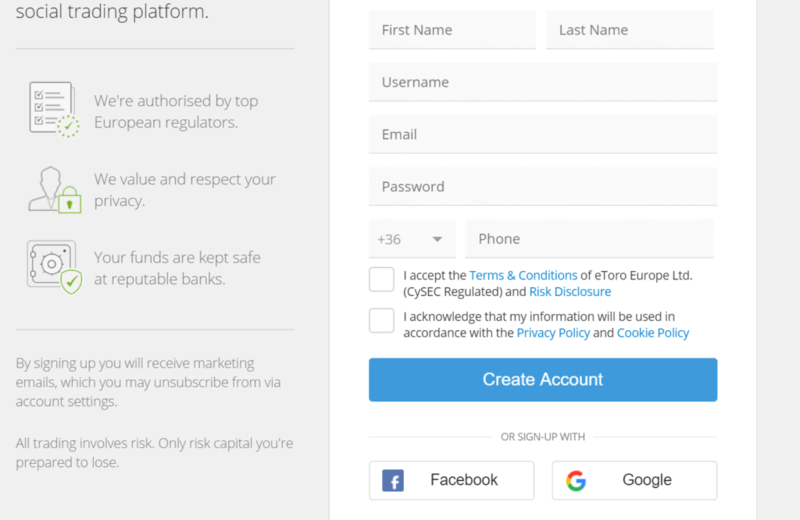 After creating your account, you need to verify it to start trading on the platform. Fill in the questionnaire and send the broker clear images of your documents that verify your identity (passport, government ID) and your residence (utility bill, bank statement, etc.). When your verification is successful, you’ll be able to start trading. However, a deposit is required first to make Bitcoin Cash USD trades. So, the first step is to add funds to your eToro account. The platform allows plenty of payment methods to fund your account, including PayPal, credit and debit card, Neteller, Skrill, bank transfers, and more. Fortunately, deposit is free on eToro, so the company won’t charge you anything for adding money to your account. Now, it’s time to buy Bitcoin Cash. Use the search bar on the top of the screen to search for BCH. After you have found the cryptocurrency, click “Trade” and choose how much Bitcoin Cash you want to buy. Always check the chart before to ensure the best Bitcoin Cash rate. If you are ready, execute the transaction to trade BCH to USD. Binance CEO Zhao Changpeng co-founded the BCH exchange in 2017 with the company’s CMO, Yi He. Firstly, the exchange was headquartered in China. However, after the cryptocurrency ban in 2017, Binance has moved its operations to Japan and Malta. 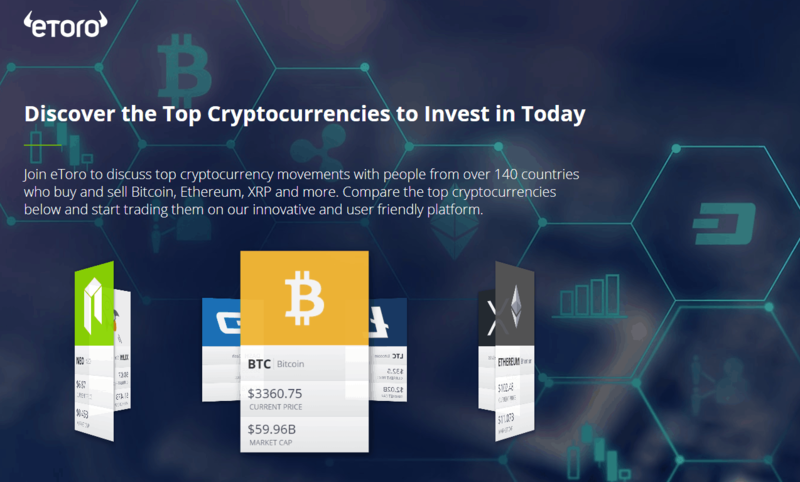 The company features a crypto to crypto exchange with a wide variety of coins and four base currencies (BNB, stablecoins, BTC, ETH). You can choose between two trading views (basic, advanced) to trade Bitcoin Cash on Binance. Now, you know the upsides and downsides of the exchange. Let’s continue with our step-by-step guide on how to buy BCH on Binance. We modified the steps in this guide, leaving out the verification part as Binance has high limits (a daily limit of 10 BTC for withdrawals), which will be sufficient for normal trading. We replaced the verification step with a security measure (2FA). 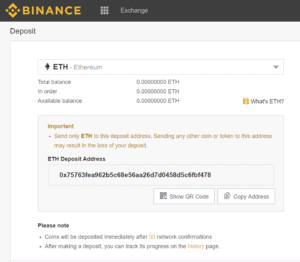 Creating an account on Binance is easy. If you prefer anonymity or semi-anonymity, Binance is a good choice as the exchange will only ask for your email address. Click “Register” on the home page and proceed with creating your account. After you opened your account, don’t forget to check your inbox and verify your email. Setting up 2FA is essential to protect your account from attackers. After your first login, Binance will ask you to set this security measure up. Do that by either using your phone number (the Bitcoin Cash converter will send a text message every time you log in) or Google Authenticator. 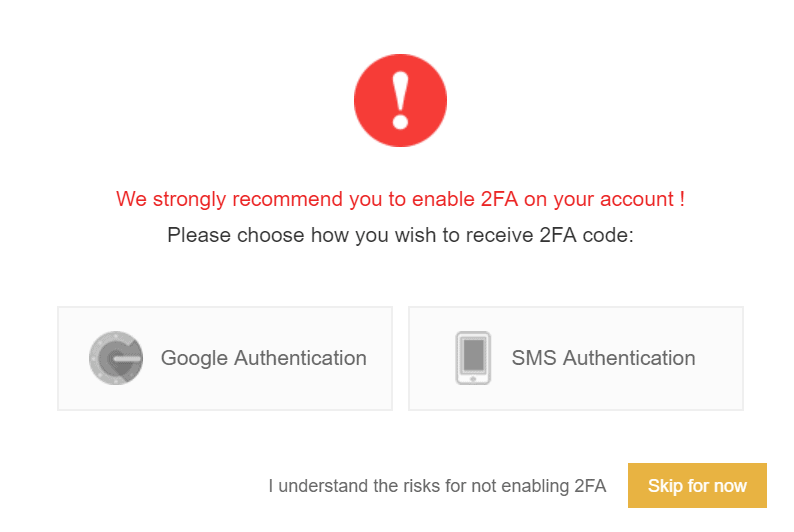 Please don’t proceed to the next step without setting up 2FA. After your account is secured via 2FA, it’s time to continue with depositing funds. 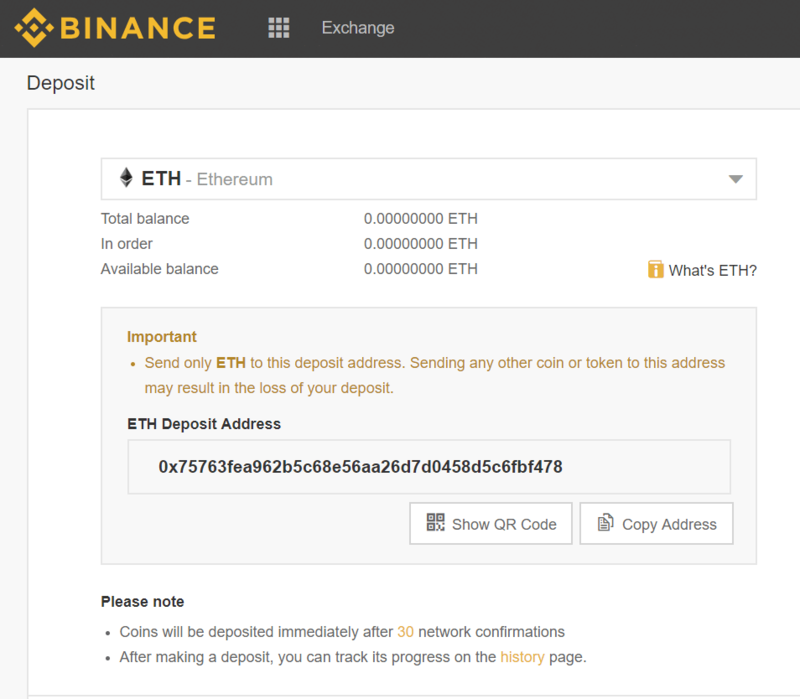 Please note that Binance only accepts cryptocurrency deposits. Therefore, you need to own coins before you can start trading on the exchange as the Bitcoin Cash exchange does not accept fiat deposits. Head to the “Deposits” tab under “Funds,” choose your desired cryptocurrency, and send funds to the address shown on the page. Make sure to double and triple check the wallet address before sending funds to avoid any mistakes. You can start trading as soon as your coins have arrived at Binance. If you have deposited any of the four base currencies (BNB, BTC, ETH, USDT), select Bitcoin Cash from the list under your base currency as well as the amount of BCH you want to buy, and execute the trade. In case you added a cryptocurrency that’s not a base currency, you have to exchange it to a base currency on the platform before you can buy Bitcoin Cash. Fortunately, Bitcoin Cash is one of the handful of coins that are supported by the San Francisco-based cryptocurrency exchange Coinbase. Hooray! So, you are able to trade BCH on the crypto exchange’s newbie and user-friendly platform. Among all of the major cryptocurrency exchanges, Coinbase has one of the lowest credit card processing fees (about 1.5%), and using this payment method is really easy as well as convenient on the service. As Coinbase is operating in the US, the cryptocurrency exchange is subject to strict regulations that require the company to request Know Your Customer (KYC) documents from its customers. Therefore, you need to raise your account limits by verifying your phone number and identity before you can proceed to buy Bitcoin Cash. To verify your account, head to the “Account Levels” tab under “Settings.” The verification page will show your current account limits and what is left of those limits as well as different features that are either enabled or disabled for your account. When you are on this page, you’ll see that there are two levels. While the first will raise your limits that will allow you to buy Bitcoin Cash on the platform, you will need to complete level two to have access to unlimited buying and selling on the service. Level one will need you your phone number and a photo ID, while the next level will require you to provide additional personal information to the operators of the cryptocurrency exchange. Now, let’s verify your phone number – by typing in the code that the exchange has texted you in the related fields – and your identity. For the latter, crypto exchanges typically accept government ID, driver’s license, and passport. Take a clear photo of either document and submit it to Coinbase. Wait for a while until the team verifies your document and either proceed to the next step or complete verification for level two. As you are planning to hold Bitcoin Cash (at least for a while) in a cryptocurrency wallet, it is essential to turn on 2-factor authentication (2FA). Fortunately, Coinbase supports 2FA in the form of text messages. Every time you log into your account, you’ll get a code from the company, which you have to type in the related fields. Also, Coinbase has an option to set a certain amount – like 1.2 BTC. If that’s reached, 2FA will be activated. To set up 2FA on your Coinbase account, navigate to the “Security” tab inside “Settings.” You’ll find a section about 2-factor authentication. Click the blue button stating “Enable Authenticator.” Also, we recommend you to choose the setting in which a verification code will be sent to your phone if any amount of digital currency is moved. Now, it’s time to buy some Bitcoin Cash. Please note that we are using credit card as the payment method in this tutorial. This method does not require you to funds your account with money before you can trade as the credit card transactions will be processed almost instantly. However, if you wish to credit your account with fiat via bank transfer, you need to first wait for the deposit to arrive before you can buy BCH. Head to the “Buy/Sell” tab where you’ll see a list of cryptocurrencies. Firstly, choose BCH from the list. Now, you need to proceed by adding your credit card as the payment method you will use to buy Bitcoin Cash on Coinbase. When you are done with that, select the amount of BCH you want to purchase on the cryptocurrency exchange. Then finish the process by executing the trade. Changelly is a cryptocurrency exchange that features near-instant transfers with reasonable fees. Unlike at brokers, such as eToro and Plus500, you need a cryptocurrency wallet to buy Bitcoin Cash on the exchange. While you can’t sell coins for fiat, the service accepts credit card payments on its platform (though they will cost you a lot). 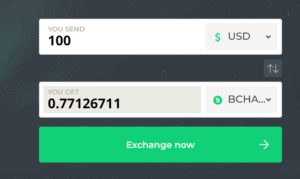 At Changelly, the deposit process is completely left out (one of the reasons for the fast transaction times). Moreover, for trading normal amounts of coins, you don’t need to verify your account, so we’ve left out that step from the guide. Let’s focus on setting up 2FA instead. 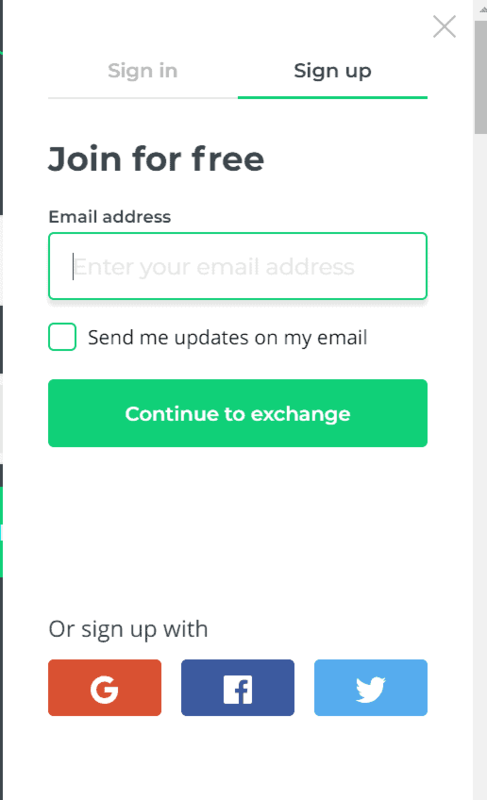 You only need an email address to register an account on Changelly. 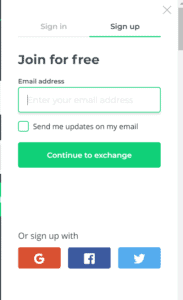 Click the “Join” button in the top right corner of the page, fill in the details with your email and desired password and continue to the next step. You can use Google+, Facebook, and Twitter to register an account faster. The next step is to set up 2FA on your account. 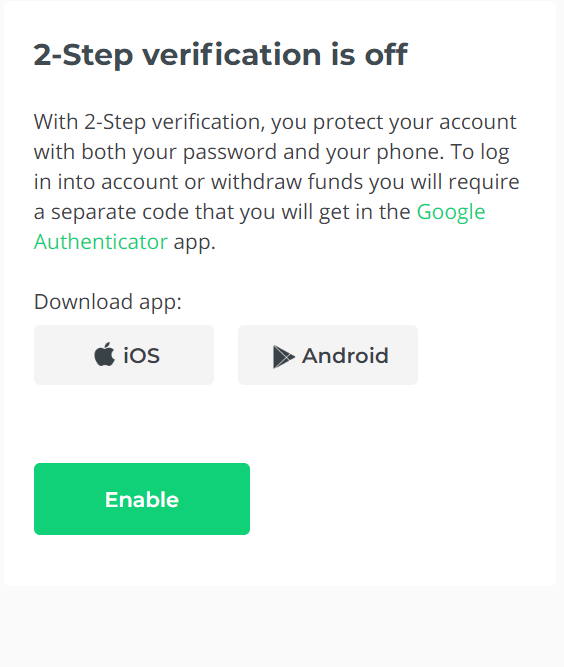 Changelly accepts Google Authenticator, which you can download to either iOS or Android using the links inside your account’s settings tab. 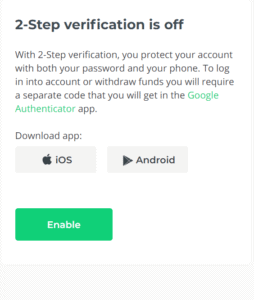 Download the app and set 2FA up for your own security, then proceed to the next step. On the home page of the website, you’ll find a converter. Choose Bitcoin Cash ABC (BCHABC) and the fiat currency you want to use to buy BCH. Set the amount of Bitcoin Cash you want to purchase. After that, you need to provide your credit or debit card details to initiate the trade. Plus500 is a CFD broker founded in 2008. With its headquarters in Israel, the company is regulated in many countries, including the UK and Cyprus. Plus500 is listed on the Main Market of the London Stock Exchange, which gives users on the platform additional safety. The service features an easy-to-use platform with low spreads and a fast, fully digital account creation process. Plus500 is a broker that offers Bitcoin Cash trading via CFDs. Therefore, you don’t need a BCH wallet to execute crypto trades on the platform. Let us show how you can do that with our step-by-step guide below. 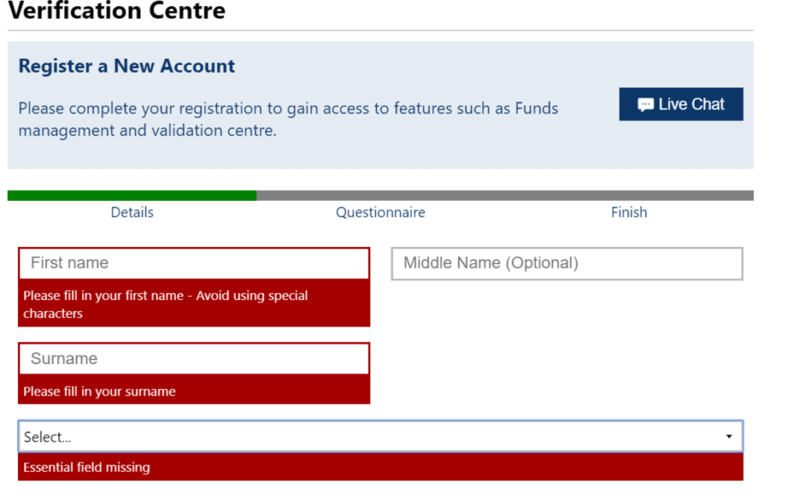 Firstly, navigate to Plus500’s website and register an account. To do that, click the “Start Trading Now” button and fill in the form with your details. 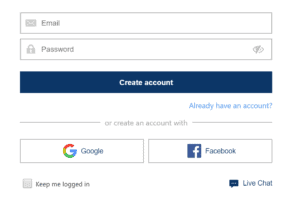 Plus500 accepts integrations with your Google+, and Facebook accounts for a faster sign up process. Once you have signed up, it’s time to verify your account. 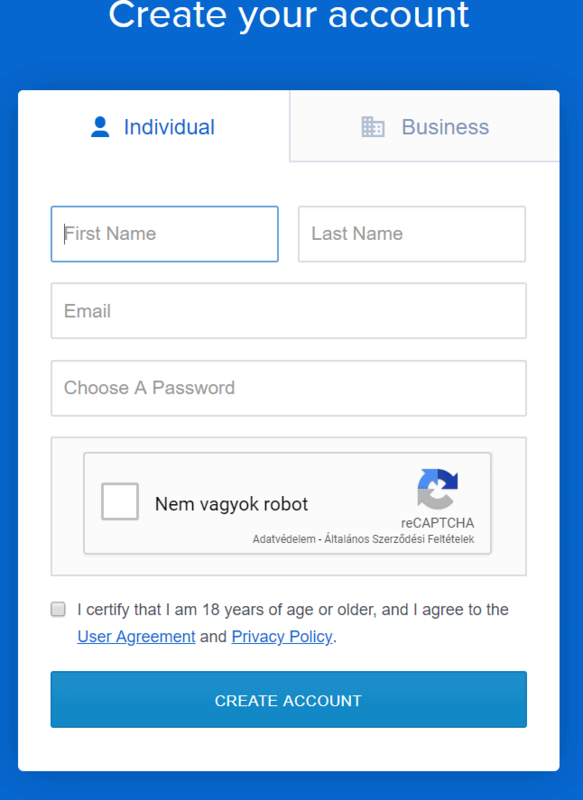 To start, fill in the questionnaire and verify your email account as well as your phone number. 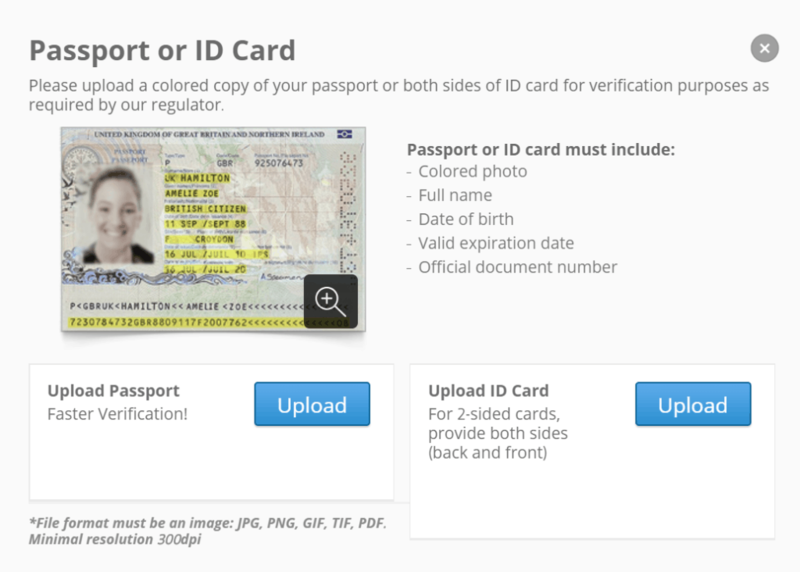 Upload clear images of the documents required to verify your identity and address. Continue with proceeding to the next step. Such as eToro, Plus500 accepts multiple payment methods for deposits, and the whole process is free of charge. 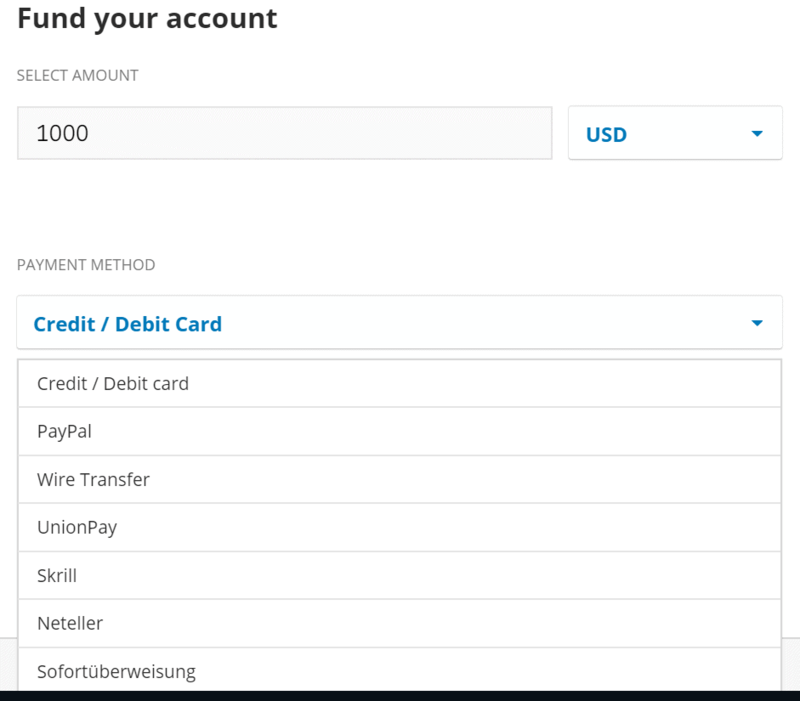 Choose “Deposit” from the menu in the top left part of the page, choose your desired payment method (credit card and PayPal payments are accepted) and the amount of funds you want to send to your account. After your funds have arrived on your account, you can start trading Bitcoin Cash. Search for Bitcoin Cash ABC (the coin is named like this on Plus500) and choose whether you want to buy or sell the cryptocurrency. Then select the amount of coin you want to trade for BCH to USD to finish the process. Europe is a crypto-friendly continent with over thousands of service providers present in the region. Among all of these European countries, Bitcoin Cash (along with other cryptos) is quite popular in the United Kingdom. 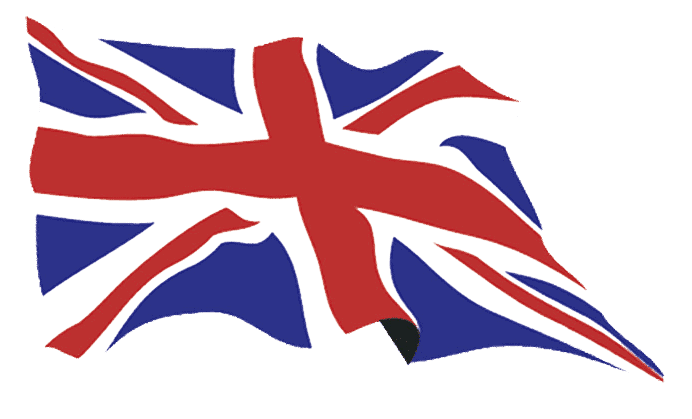 As there are plenty of services that offer BCH trading, it can become hard to choose the best for UK citizens. And this service is eToro. Along with choosing the broker as the best exchange for Bitcoin Cash in this article, eToro is the best solution for UK citizens to buy BCH as well. The broker offers outright Bitcoin Cash trading with an FCA regulated service. The platform is easy to use, newbie-friendly, featuring a lightning fast registration and verification process, social trading features, and multiple payment methods (including PayPal and credit cards) that you can use to fund your account. Checking the stats, North America is the top crypto-friendly continent in the world. There are over 2,000 payment services that are offering solutions for cryptocurrencies – Bitcoin Cash included – and blockchain technology. As a part of digital currency exchanges and brokers are focusing on European customers – and some of them exclude US and Canadian citizens due to the strict regulations in both countries – it is crucial to choose the best exchange for the locals in both countries. As we have tested the services of numerous digital currency exchanges and brokers who offer coin trading, we have selected the best solution for US and Canadian citizens. And this service is Coinbase, the perfect platform for both newbies and expert traders. Bitcoin Cash is one of the handful of coins Coinbase supports. The cryptocurrency exchange offers credit card purchases with one of the lowest fees on the crypto market. Oceania is not a continent flourishing with cryptocurrency and blockchain service providers. 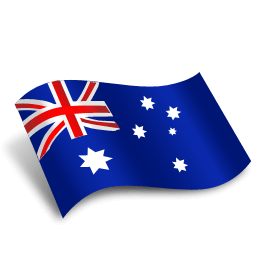 However, there are plenty of Aussies that are interested in this new tech and the coins – including Bitcoin Cash. The biggest markets of cryptocurrency exchanges are concentrated in North American and Europe. Therefore, many services focus mainly on the citizens of these regions. So, here comes the question – which is the best exchange for Aussies? We’ve tested a number of crypto exchanges and brokers, and we ranked Binance in the first place for Australian citizens. Why? The crypto-to-crypto specialized service offers high limits for its users – so there’s no need to verify your account if you are trading normal amounts of coins -, the trading fees are low, and the exchange supports a wide variety of coins. And – of course – Australian citizens can register a free account on Binance. You own the Bitcoin Cash, you have the right to move it, sell it, and transfer it as you wish. How to trade Bitcoin Cash with a trading robot? Automated trading solutions have been present in the fiat world for a while. These services use algorithm-fueled robots that are scouring the markets to find the best exit and entry points for trading. Therefore, the bots are making potential profits fully automatically. As the cryptocurrency market has grown bigger, trading robot solutions have been implemented to coins too, including Bitcoin Cash. The benefits of using a trading robot to trade Bitcoin Cash are clear. Firstly – as opposed to “manual” trading -, you don’t need to sit in front of your computer all day deploying technical analysis to the BCH chart. Instead, you only need to set up the bots – some platforms even have their own strategies too (so you don’t need to develop one) – and monitor their performance. Secondly, automated cryptocurrency trading requires no trading knowledge from the user. So, trading Bitcoin Cash via crypto robots is completely newbie-friendly. While BCH trading robots present a great way for all kinds of traders to make potential profits, automated trading is considered as a high-risk activity. However, the higher the risks, the higher the profits can be. We have a page dedicated to crypto robots; if you are interested in trading BCH via such services, we recommend you to check it out. As shown in the previous step, it is possible to buy Bitcoin Cash with credit card. While bank transfers can be slow and inconvenient, credit card payments are the fastest way to buy BCH. When using a credit card to purchase cryptocurrency, your funds will arrive almost instantly. On the flip side, card transactions cost more than bank transfers or crypto to crypto payments. The big question is: which provider should you use? As seen in the previous step, using a credit card on Changelly comes with high fees (almost 10%). If you want to use a Bitcoin Cash exchange, we recommend Coinbase for credit card transactions as the service has a 3.99% for card deposits, which is reasonable compared to its competitors on the Bitcoin Cash market. Using a broker is a good option too (such as eToro and Plus500) as both services offer cost-free credit card deposits. PayPal is a popular payment service that is used by over 244 million customers from all over the world. Many companies, especially e-commerce sites, accept transactions via PayPal as paying via the payment service is super easy and fast. On the flip side, the company has high fees and strict policies. The latter has an effect on the cryptocurrency industry as PayPal does not like coin transactions. Therefore, Bitcoin Cash exchanges can’t accept payments via PayPal. So, if you want to buy Bitcoin Cash with PayPal, you have to use workaround methods. You can’t directly send Bitcoin Cash to PayPal and vice versa. One method is to use a third-party service, such as Localbitcoins.com, that will connect you with local customers who will sell you Bitcoin Cash to PayPal. However, that would cost you a nice fee and could result in PayPal disputing your account as it is against its policies. Furthermore, local transactions are not as safe as using brokers or exchanges. So, that’s left us with another option, which is using brokers to buy Bitcoin Cash with PayPal. 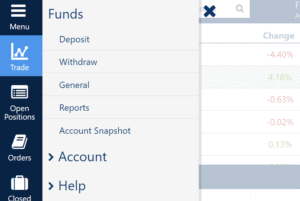 As brokers like eToro and Plus500 accept PayPal deposits, you can fund your account with the service. Then use your balance to buy Bitcoin Cash. That’s basically an indirect method to buy Bitcoin Cash with PayPal. In some cases, you don’t want to use fiat currency to buy Bitcoin Cash. Why use your credit card, PayPal, or bank account when you have some BTC sitting in your wallet? As Bitcoin is the top cryptocurrency among all coins, it is widely accepted as a base currency on different cryptocurrency exchanges. One of these exchanges is Binance, a crypto-to-crypto specialized service that we have chosen as the best for buying Bitcoin Cash with Bitcoin. You can easily transfer your BTC to your Binance wallet, choose the BCH/BTC trading pair, and exchange the two coins in the matter of a few minutes. And it won’t even cost you much. If you need more details on the buying process of Binance, read back to see our step-by-step tutorial. When you have bought BCH, and the price of the coin just went up to a specific level, you would want to sell the digital currency to make profits. Or – in the opposite case -, you want to exchange your Bitcoin Cash to minimize your losses. We’ve shown you how to buy the coin on different services. But how can you sell Bitcoin Cash? Let us show you one of the top platforms. 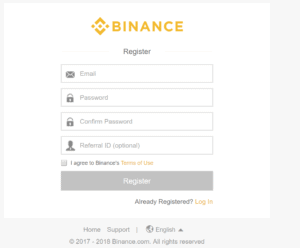 Taking that you have a Binance account – if not, read back to learn how you can register an account on the exchange – you need to head to the trading platform. Choose the currency pair for BCH from one of the four base currencies (BTC, ETH, BNB, and stablecoins), and choose the sell option. Execute the trade. We’ve listed you the very best brokers and exchange where you can buy Bitcoin Cash. You also know how to buy BCH with different payment methods and what are the pros and cons of having a wallet. Now, it’s your choice to choose between the different options and solutions as well as to set your goals. From all the services we tested, eToro comes out as the winner. The broker’s social trading platform is easy-to-use, newbie friendly, featuring plenty of payment methods to choose from. Account creation is fast, and you own the actual coins you are trading as the service offers outright Bitcoin Cash trading. While many of the properties of Bitcoin Cash are based on the protocol of the Bitcoin blockchain, there are some major differences between the two cryptocurrencies. When comparing Bitcoin vs Bitcoin Cash, the most important factor to consider is the block size limit of the two coins. But first, let us explain to you what the block size limit is. The block size limit restricts the maximum size of transactions that can be processed by a cryptocurrency’s network in each second. This setting was first introduced by Bitcoin’s creator Satoshi Nakamoto to prevent malicious parties from attacking the network of the coin. However, as the cryptocurrency’s system has been upgraded (including Bitcoin Cash’s network), this problem has been fixed. So, there’s no need to keep the initial 1 MB block size limit to protect the network from hackers. As the block size limit is restricting the number of transactions processed in each minute, it means that miners are allowed to process only a certain number of transactions. If the transactions reach the limit, the ones that are beyond the limit are put into the mempool for the miners to process them at a later time. If many users are active in the system, that could lead to a congested network. The result of that could be higher fees and slower transaction processing times. So, how is the block size limit related to the Bitcoin vs Bitcoin Cash debate and the two cryptocurrencies? Because this was the reason why BCH was born in August 2017. During a long debate on the scaling issues of Bitcoin, the cryptocurrency’s community has been divided into two camps. The first one supported a decision in which Bitcoin’s network would be upgraded by increasing the block size limit. On the other hand, others have denied this solution and proposed upgrades that would solve Bitcoin’s scaling issues via lowering the size of the transactions via a feature called SegWit that could lead to additional upgrades via the Lightning Network (a network featuring off-chain transactions). As neither parties could agree on one joint solution, the Bitcoin blockchain has split. SegWit and Lightning Network supporters stayed with BTC, while the others went with creating Bitcoin Cash that featured an initial block size limit upgrade of 8 MB (which has been upgraded to 32 MB). Critics of Bitcoin argue that implementing SegWit and the Lightning Network could result in a more centralized ecosystem. On the other hand, supporters of the upgrade state that the Lightning Network helps Bitcoin scale much better than BCH and transactions will be cheaper and faster if the upgrade is ready. What is a Bitcoin Cash Hard Fork? To date, Bitcoin Cash had two blockchain splits. The first one was the August 2017 hard fork when the cryptocurrency was born. The other happened in a little more than one year later. This is what’s known as the November 2018 BCH hard fork. Now, let’s see the major events and disagreements that have led Bitcoin Cash’s second split. In August 2018, the developer group Bitcoin Cash Adjustable Blocksize Cap (Bitcoin Cash ABC) announced an upgrade for November the same year that would feature two important goals. Firstly, the developers sought to introduce non-cash transactions to the Bitcoin Cash blockchain (smart contracts and oracle prediction services). The second upgrade for the November 2018 hard fork was to change the ordering of the transactions in the BCH network from topological to canonical ordering. Soon as the proposal for the November hard fork was released, critics have started appearing in the Bitcoin Cash community. This group argued that the main goal of BCH is to deal with payments only, so there’s no need to prioritize non-cash transactions on the Bitcoin Cash blockchain. One of the main critics of the upgrade was Craig Wright, a developer who has earned notoriety in the crypto community by claiming that he is Satoshi Nakamoto – Bitcoin’s creator. The other major critic was Calvin Ayre, a billionaire who is the CEO of one of the largest Bitcoin Cash mining pools, Coingeek. Wright and Ayre both opposed to the canonical transaction ordering as well as they wanted the block size limit of BCH to be increased to 128 MB. Furthermore, Wright did not see the value that incorporating smart contracts and oracles into the BCH blockchain could add for the cryptocurrency. The supporters of the November 2018 Bitcoin Cash hard fork included Bitcoin.com CEO Roger Ver and Bitmain (the largest Bitcoin mining hardware manufacturer) co-founder Jihan Wu. Wu’s Bitmain also controls the mining pools Antpool and BTC.com. Disagreeing with the Bitcoin ABC upgrade, the Wright and Ayre-led opposing party had created its own proposal: Bitcoin SV (Satoshi’s Vision). Wright argued that this proposal contains the original visions of the Bitcoin creator Satoshi Nakamoto. This has led to the so-called Bitcoin Cash “Hash Wars.” In this conflict between the Bitcoin ABC and Bitcoin SV parties, both parties used their mining pools and resources to disconnect (and connect more) rigs from mining BTC to supporting the BCH ecosystem. The goal for one party was to acquire the most hash power, so their blockchain would be the longer – therefore they would “win.” However, neither party’s decisions were rational from a financial point of view. While the price of BTC has crashed soon after the Hash Wars have started, the companies that were affected by the whole debate have lost about $12 million worth of funds in trying to take control of the Bitcoin Cash blockchain. Which service offers the most secure Bitcoin Cash wallet? We have tried plenty of Bitcoin Cash wallet solutions, and we think that the best BCH wallet is the most secure one. Why? As you are holding coins in a cryptocurrency wallet, your funds are not protected or guaranteed by any third-party service (like banks or payment processors). And – as hackers are actively targeting cryptocurrency users -, you need to find a secure solution where you can leave your coins without worrying about the attackers. Therefore, in our opinion, the best Bitcoin Cash wallet services are hardware wallets. These solutions come with a hardware device, which has a PIN pad for verifying outgoing transactions as well as logging into your wallet. Let us tell you why this feature of hardware wallets give your coins extra security. If a hacker tries to steal your funds that are on a hardware wallet, he has to first hack the software side of the wallet. Then he has to acquire both your PIN and your hardware device. In case the attacker manages to do all of the aforementioned actions, that would make a great story for an action movie about a mastermind hacker. But – in real life -, the attacker would have a really-really hard time stealing funds from a hardware wallet. So, we are recommending you to buy a great hardware wallet like Ledger, Trezor, or KeepKey. All of the aforementioned brands are trusted and widely used in the crypto community. However, in case you want to stay with using a software or web-based wallet (and don’t want to pay for using a Bitcoin Cash wallet), good solutions include the Blockchain.com Wallet and Infinito. All of the solutions support BCH as well as other cryptocurrencies. What’s your Bitcoin Cash price prediction for 2019? We can’t provide you with a precise Bitcoin Cash price prediction for 2019 and for the years after. And we think that no one can. The reason for that is the relatively high volatility of cryptocurrencies (including BCH). A coin’s price can increase by 10% in an hour and go down by the same percentage in the next. And, in the short and mid terms, no one – including expert traders and all-star investors – can predict that precisely. However, in the long-term, you can calculate an estimated Bitcoin Cash price prediction. If the developers are working hard to upgrade and maintain the stability of the coin’s network, that could lead to an increasing rate of adoption. As the adoption increases, a growing number of people will start using BCH for different purposes, including holding the digital currency and using it for payments. If that happens, the price of Bitcoin Cash will increase with the adoption rate. How do I buy Bitcoin Cash anonymously? As most of the cryptocurrency exchanges and brokers are requesting different documents (KYC and AML) from their users, it becomes harder to buy Bitcoin Cash anonymously. However, there are two methods that can be used to bypass the aforementioned obstacles. The first is to buy BCH using cash from a local seller. In case he or she does not request any documents from you, the whole transaction will be anonymous. The second option is to use a cryptocurrency exchange that does not request KYC and/or AML documents from you, neither any personal (sensitive) information from you. Binance and Changelly are two good options for such exchanges. If you don’t trade a large amount of coins every day, neither service provider will request any documents from you. Therefore, you will be able to buy Bitcoin Cash on these services anonymously. How do I buy Bitcoin Cash with Cash? While a part of the crypto enthusiasts prefers to purchase coins via credit card and bank transfers, others prefer to buy Bitcoin Cash with cash. There are two options to buy the coin with cash. The first is to find a crypto ATM that supports BCH near you. You can use a cryptocurrency ATM finder service or just Google (Maps) to search for a Bitcoin Cash ATM in your area. The second option is to use an intermediary service – like Localbitcoincash – that will connect you with sellers in your area who are selling BCH for cash. Just head to the intermediary service’s website, choose a seller you prefer and contact him or her to exchange fiat to Bitcoin Cash. What is the best way to buy Bitcoin Cash? The best way to buy Bitcoin Cash depends on your goals and preferences. For example, your priorities when purchasing the coin could include cost, time, and anonymity. Let us show you the best ways to buy Bitcoin Cash for the aforementioned preferences. In case you seek to focus on quick transactions, your best choice should be to buy Bitcoin Cash via PayPal or credit card. While you need a workaround method to buy BCH with PayPal – read back for more information -, both payment methods are almost instantly processed. Therefore, your coins are credited quite fast. On the flip side, credit card transactions cost more than bank transfers. 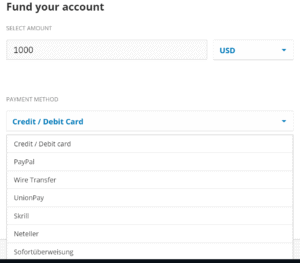 Though, if you use a broker like eToro or Plus500, there are no fees for credit card or PayPal deposits. The most cost-efficient way to buy Bitcoin Cash is via bank transfer, especially if you are an EU citizen where SEPA transactions are supported. However, you need to wait multiple working days for your transfer to arrive. So, if you are in need to of BCH in a hurry, this payment method would not work out the best for you. The final priority is anonymity. Some users prefer to stay as private as possible when they are buying Bitcoin Cash. Therefore, the best way to buy the coin for them is locally with cash or by using a cryptocurrency exchange where the initial limits are high (so there’s no need to verify your account). Is Bitcoin Cash a scam? As far as we know, Bitcoin Cash is not a scam. The coin has rewarded thousands of users with profits, and many people in the world pay their everyday expenses in BCH (at merchants where the coin is accepted). However, as the Bitcoin and Bitcoin Cash (as well as Bitcoin SV) communities are fighting each other, as well as there are websites spreading fake news, you may have read that Bitcoin Cash is a scam. But that’s certainly not true as the coin is completely legit. Should I invest in Bitcoin Cash? You should decide yourself whether to invest in Bitcoin Cash. If you are interested in the coin, have the money, and you are positive about the future of BCH, go for it. Should I buy Bitcoin Cash this year? As we are in early 2019 and there’s still a bear market present, a part of the crypto enthusiasts decided to wait until the market recovers to buy Bitcoin Cash this year. However, if you are bullish about the BCH price for this year and you have the required financial background, you may decide to buy Bitcoin Cash now. Hopefully, the price of the coin will go up, so as your investment. 4 (Step by Step) How to buy Bitcoin Cash on eToro? 7 How to trade Bitcoin Cash with a trading robot? 9 How to sell Bitcoin Cash? Can somebody buy bitcoin cash anonymously ? Hello Broady545, with all the negative attention cryptocurrencies have received recently, it is getting harder and harder to buy BCH anonymously. However, as you can see in this FAQ, there are ways to buy cryptocurrencies without revealing sensitive information to the brokers. How have you chosen the best broker to buy your Bitcoin from? What are the things you have thought about before choosing the perfect and most reliable one for that purpose? Hello Ann, we assess a number of factors before choosing our top digital currency broker. These factors include security, licensing, authenticity, operating regions, availability, and ease of use among many others. By our evaluation, eToro has earned its place on the top of our list. You can learn more about the digital assets broker here. Great, this was really helpful. Wow… Thanks for the information. But is this not Bitcoin, I am well aware of how to buy and sell bitcoin and I will love to know more about bitcoin cash as well if it is different. Can you help with the best place where I can buy bitcoin cash with ease? Hello Roland, yes, buying Bitcoin Cash is a very easy process if you have bought and/or traded cryptocurrencies before. Our recommendation for the best place to buy Bitcoin Cash is eToro – a top-class digital assets broker that operates on a global scale. Buying bitcoin using credit cards carry the risk of charge backs or not? Either buy online or not? Hello Charles, using credit cards to buy cryptocurrency does have a very small risk of chargebacks depending on the bank you are using. To protect yourself from chargebacks, make sure that you use a highly-authentic exchange platform or broker like eToro.